Life is...well...grand. I am so blessed that I get to be a Dad and a Husband. Married for 21 years (when I wrote this) to a woman who continues to make me want to be a better man. And I love her for it. Being a Dad to a son and a daughter - has to be one of life's greatest gifts. They currently in Yrs 10 & 8. And are so much fun (and challenging as well). We live on the Sunshine Coast and thoroughly enjoy being a 5min bike ride to the ocean, 60 sec walk to the lake for a paddle or swim. And just to enjoy the 'slightly' less busy lifestyle. I only had two years at Radford - Yrs 11 & 12. Got a scholarship to go to ADFA and went straight out of Yr 12 to the Army at 17. Was posted around Australia and overseas. Including 3 combat tours. And resigned after a fun 18 year career. Owned and ran a National Mortgage Broking company. Sold that. 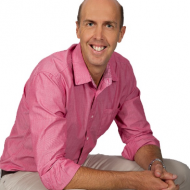 Was the Director and Head Coaching for Qld & NT in a personal development and property investment business. Enjoyed that for about 7 years. And have been running my own business for the last 10+ years. Where I get to show small business owners & entrepreneurs how to afford their dreams & goals - by aligning their business & financial goals with their authentic self and lifestyle. It's pretty cool to see the positive impact I am grateful to have in so many different people. And also to have my own time, work my own hours. And really walk my talk. During this time I've been fortunate to travel lots. Trek the ranges of Papua New Guinea. Mountaineering in New Zealand and led a 10-man expedition in the Himalayas. Climbed Half Down in Yosemite. Lived for a few years in Hawaii. And camped / 4WD around most of Australia. Including some pretty cool and remote places. Life is full of adventures and constant learning. I am striving now, more than in the past, to be the best version of myself I can. To be an awesome Dad, loving husband, great mate - and to live in the now. With purpose, passion and have a bloody good time in the process. You know what - I had no idea. And I certainly have had a vast and varying career / lifestyle. Where it was so true - for me - that school facilitated some learning skills.The ability to develop my social skills.But really is just a small part of life. And a stepping stone in finding yourself. Grad Week - and the weeks leading up to it. Getting our Final Results back. Drawing on shirts - toilet paper everywhere. Moving cars between bollards. Just a good time to have with friends. School is not so much about the grades. But about beginning to mature and understand yourself. I wish there was more time helping us teens understand the 'real world'. Values and being OK to be yourself. School was fun. But certainly not worth stressing about. Sure knuckle down in your study. But just as importantly, enjoy friendships and activities in and outside fo school. Enjoy being in a team sport. Go camping and get outdoors. These memories and experiences will mean far more to you and be more valuable than the marks you got in maths.